The Postman is about the story of a postman who works in a small town. The play describes about the human relationship of the post man and the heartfelt feelings towards letters. A pretty performance by junaid Kaife had given good memories to the spectators. His impressive acting and engagement with audience is an asset to the performance. 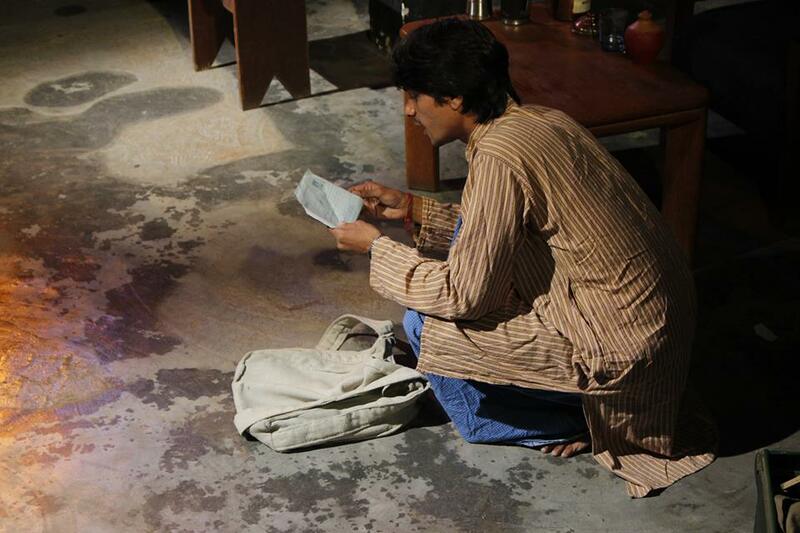 The poetry of Shaurya and dramaturgy of Happy Ranajit and costumes of Anita are added advantages of the performance. Intial the show started with the song chitti na koi Sanders by Jaggit Singh created a mood of association with letters in the minds of audience. And the show started with the description of post man's life , an autobiography, and the performance revealed the relationship among the people by addressing the letters of an young aspirant who stays in Kolkata writes to his wife about his arrival, The second letter which reveals the story of son who wants to stay away from his home but he was unable to inform his parents than he wrote a letter to his father who is nothing but the post man. A shocking letter for the post man from his son connects his realtionship with the son and how he had brought up from his childhood. The director tried to attempt to understand the relationships in the present society and how people were separated by connecting with mobile devices. "Pass me rehte hi Lekin pata nahi chalta hi (translation they are close but they dont have address) . Through the play the director have tried to explore the mode of communication how it has transformed from own to let board. "Till early 21st century we used to receive letters, Rakhis, Money orders from post man, we feel connected to the family. And post man became itself is a family member. Tell me, how many out young generation people do know about the postman. They were so busy with Face book, what's app and other social media apps rather than writing on paper. This performance is an attempt to bring back their memories and connection with the postman" said MURALI BASA, the Designer and director of the performance. The performance happened at Studio Safdar in Ranjeet Nagar on 18/10/15. It's a Royaala Theatre Society presentation and supported by SAROJ CREATIVE Services, Delhi. "The performance is a different experience, playing a role of postman is a great experience. In my life I hardly see a postman in my life. But where as I tried my best to do on stage. The audience were well reacted and communicated with me in a good way. I got good energy from audience which helps to prove my self in stage and tried to do postman role easily" The play performed at SAFDAR STUDIO, Delhi. We (Dance Union) are excited to bring 'Lighting Design' by popular demand to performers & performance-makers across Delhi-NCR as the next capacity building workshop under 'Dance Union'. 'Technical rehearsal' is a major part of a performer's life. It involves understanding of lights, sound & stage for the performance to be enhanced and imagined in its finality. As performers, we are mostly juggling with these aspects. This workshop is designed to teach the basics of light designing that will enable each performer to understand, engage with and have a conclusive dialogue with the lighting team (designers & technicians). This is a two day workshop with theory and hands-on practice. Murali Basa, a practitioner in lighting & direction and a research scholar on the digital arts and performance in Indian context, is our esteemed facilitator for this workshop. Anasuya Vaidya of 'Akshara Theatre' has made this possible at a very short notice to partner with Dance Union to conduct this workshop at the Indoor Katah Studio, graciously. We are very thankful. at desk by 10:30 AM on 13th August. Lunch is available on purchase. Kindly register at the link below by the 11th of August, 5 PM. Please circulate amidst your friends & peers and be sure to be there! I tried myself to work with Rasika Agase as I was very much impresseive with her working style. Somehow I got a chance of opportunity through Zessan. for me it's a small shock when he asked me he asked me to execute the lights. I started listening their lines in front of Bhahumukh and came to conclusion that it will be a different experience. Yes finally I had that. By the time I have seen the set I was totally confused how to make more visible. After 10 mins discussion I understand that the whole play is going in three layers. 1. The narrators narrating the story of Romeo Juliet. 2. The adaptation of the play in contemporary performance. 3. The original Shakespeare's Romeo Juliet. As know the story of the original play it will be easy for me that's what I tthought initially. We had gone for a tech run cue by cue and I programmed all the cues accidenordingly. And executed the lights in smoother way. It's a cool experience when one understand the thematic format of design. A tribute to Guru Yelleswarapu Suryaprakasa sarma Garu, It was my pleasure to work with the eminent guru Smt Aruna Bhikshu. I have discussed the colour scheme and made a variant colour scheme in the live performance. Mahati Bhikshu performed as an experienced dancer made a clean gesture towards her strong career in a traditional dance performances. Eventhough thr stage has limited lights, the best intensity and colour have come up with clear images. 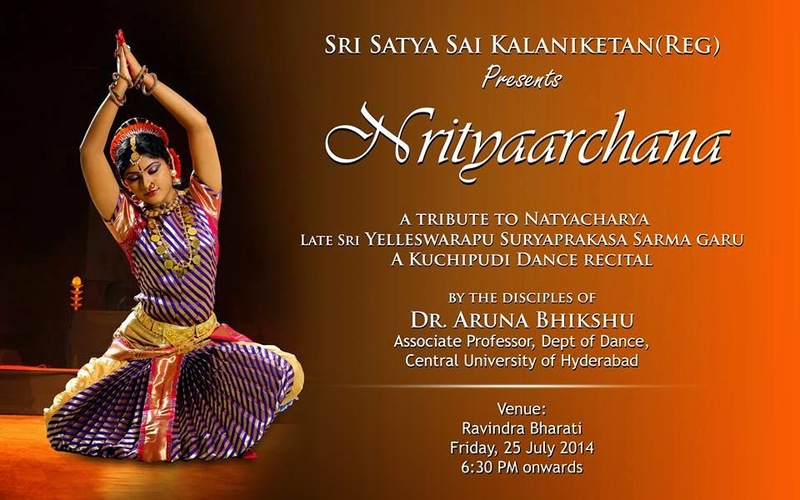 Jaavali (జావళీ) is a dance performance by Mahati is another intersting performance. Music by D.S.V. Shastri have given a melody music for that night. An artistic approach towards 377 verdict, A play about not straights, A love story of the marginalized people. From the day 1 we have started working on the play through the scenography. The play has mutli places . We have started creating a model in a way that where we can find "hide and seek" through the set. It was intially designed as rigid set in the centre stage and the other sides we have attached some flats to counter the rigidness. But where as in the second show we have transformed all these rigidness of the set into flexible. The innovation of this particular module of transporting of the set, added choreography is an asset for the play. The set and the lights have given life to the whole play. Its a brave attempt made from me in accordance to the budget. Those locations in the story have been executed through the minor displacements of the flat of 6 by 4 ft with the net cloth. I was also trying to bring out the depth through my lighting which was appreciated by more audience in SRC. Murali Basa, done his Post Graduation in Theatre Arts from University of Hyderabad. He worked for creative productions like 'Oorubhangam', 'Alberts Bridge', '30 days in September', 'Macbeth', 'Antigone', 'Roop aroop', 'Param Purush', 'Evam Inderjit',and some other traditional Choregraphy works with eminent directors like Prof. Ramanujun, Prof. Mohan Maharshi, Prof Jane Collins, Satyabrata Rout, Bapi Bose, Tripurari Sharma, Bhikshu,and Rajiv Velicheti. He worked as Production Assistant and Lighting Designer at Bhoomika Creative Dance Centre, Delhi. He has done his internship as an Audio Digitizer at AIIS, Gurgaon. 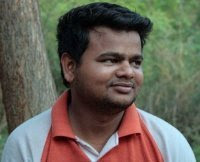 He is currently a research scholar in theatre arts at UOH with a junior research fellowship from Govt. of India. His specialisation in practice is lighting and direction and his research topic is on the digital arts and performance in Indian context. His effort is to explore the interwoven relationship between the live and digital images in performance in the backdrop of changing paradigms in performance making and reception in globalised cultural environment foussing on Indian contemporary modern performances. I am not avoidable at 9493938573, muralibasa@gmail.com.